We all have some type of food that we call "comfort food" and for many it is candy or something sweet. Most of the time you will find a drawer full of hard candy, chocolate, or chewy candy next to my computer. I guess you could call it my comfort candy drawer. This is the easiest gift there is to make. Type or copy and paste the poem or story into your favorite word processing program. Make the font small enough so that you can print it out and it will be approximately 4" x 6" and fit into your jar nicely. You might want to hand write the poem or story for a more personal touch. 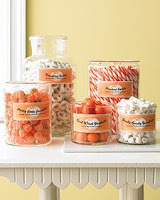 Fill the jar with candy. Add a bow on top. Viola! Simple and easy gift from the kitchen.